The Dow Jones Industrial Average (the Dow or the DJIA), the Standard & Poor’s 500 (the S&P 500), and the NASDAQ Composite Index (the NASDAQ Composite) are the three most prominent stock indices in the U.S.
8.2: When was the Dow Jones Industrial Average (Dow Jones) established and what types of companies were the originally listed on the Dow? The Dow was established in 1896 and originally included mostly gas and coal companies. Answers #1, #3 and #4 are far too specific; an index consists of stocks offered by many companies (500 on the S&P 500, for example) and therefore the index can only tell you about how a general group of stocks has changed over time. 8.5: Which of the 3 most prominent stock indexes in the United States is most closely related to technology stocks? 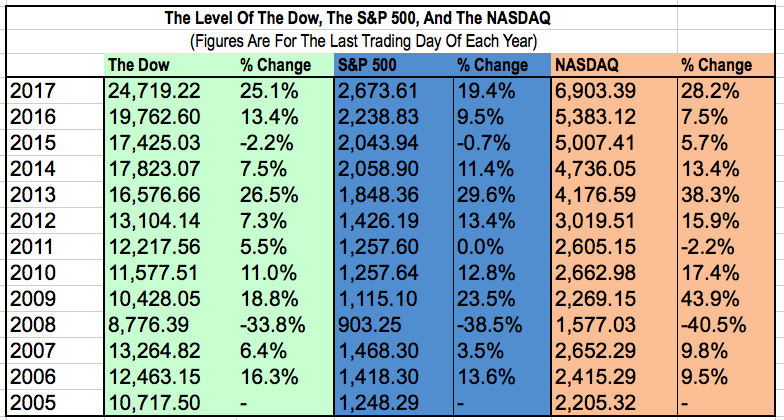 Of the three major indices, the NASDAQ contains the most companies from the technology sector. 8.6: What was the percentage change in the value of the Dow Jones from Dec. 31, 2007 to Dec. 31, 2008? What was the cause of this change? The drop was caused by the Great Recession -- the biggest financial crisis in over 70 years that began in 2008.